This book was written as a guide for anyone wanting to extend their knowledge of plants grown in any type of warm place – tropical, sub-tropical, greenhouses, and court yards that have become heat traps in temperate places. Tropical Plants grow both in the tropics and sub tropics; and in protected parts of some temperate gardens. Many are also grown as indoor plants. This wide use of tropical plants makes this book a valuable reference to horticulturists, nurserymen, gardeners or any plant enthusiasts, in whatever climate they might live. Many of our most magnificent gardens can be found in hot places. The range of plants available for such situations, provide a palette of unique textures, colours and shapes. The heat, and humidity in moister areas, encourages diversity of plant life. With the right approach, and careful selection of plants, a hot place can be turned into a very livable garden. Plants in fact can help modify the temperature in a hot place. Large plants not only shade the ground below keeping it cooler; but will keep the temperature lower by not trapping and radiating heat in the same way as other surfaces, such as rock, paving, metal or glass. Plants also lower temperatures in their immediate vicinity through the release of water vapour from their foliage during photosynthesis. 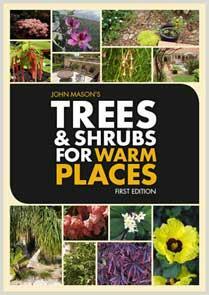 This book is relevant to gardens in tropical and subtropical climates; and to hot places in cooler climates such as: growing in Greenhouses; "heat trap" courtyards; and arid sites. What Causes An Area To Be Warm? There are a number of things which contribute to a garden space becoming hot. Most heat will come directly from the sun. Generally the closer an area is to the equator the warmer it is. The average maximum daily temperature will generally increase the further you move away from coastal areas. The sea or ocean has a temperature moderating effect. Temperature also decreases as altitude increases, so even in tropical regions high altitude sites will normally be significantly cooler than adjacent lowland sites. Some coastal areas may also remain warmer than other areas at the same latitude (distance from the equator) due to the presence of warm ocean currents. Cloud cover has an effect on air temperature near the earth's surface, by keeping it cooler in the day, but warmer at night as warmth cannot escape the atmosphere. Existing vegetation can dramatically modify temperature over a large land area. Vegetation will buffer the temperatures by keeping air slightly warmer in winter and cooler in summer. Some materials will absorb and/or store, and radiate heat more than others. Materials such as metal, stone, glass, and paved areas can contribute to increased heat in a garden. The more these materials are used, the more likely the garden is to warm up, and stay warm. Heat can also be generated (to a lesser extent) by human activity such as burning off, factories, motor cars, etc. Factors such as these often mean that temperatures in a city are likely to be higher than in the surrounding countryside. Many of our most magnificent gardens can be found in hot places. The range of plants available for such situations, provide a palette of unique textures, colours and shapes. National Herbarium, Royal Botanic Gardens, South Yarra. Alex & Mirella Jackimoff: Alexanders Nursery, Coombabah, Qld. Graeme MacDonald: Toona Rainforest Gardens, Mudgeeraba, Qld. Brendan Hicks: Rainforest Seclusion Nursery, Thornlands, Qld. John Bunker: Redlands Nursery, Qld. Alison Buck: Hawkins Home and Garden Centre, Chandler, Qld. Like this book? You might also like ACS Distance Education's online courses here.